I recently posted about a DLVA Auction I were interested in. 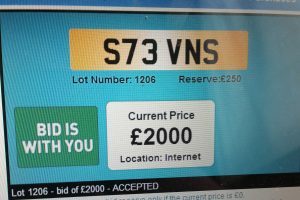 As it happens the main plate I were interested in were S73VNS or in plain text STEVENS. I opened the bidding at £950, and it rapidly hit £1,500 so I hit £2,000 hoping to scare people away, and then another 2 bids came in, £2,100 and £2,200 and it sat there for a while. I debated pushing it to £2,500, but didn’t in the end. Now a month or so later, I kind of regret not pushing that final 2.5k bid. As a personal reg and not investment, were about £500 over my personal money amount. Now I have picked up a suitable car to put it on, which were a steal (pending a full check up), I could have swept the £500 out of the car fund. This is all the assumption that a £300 leap on £2200 would have secured it for me.